Mounting Block VS Egg-Timer: Who Wins? / Mounting Block VS Egg-Timer: Who Wins? The ingredients are there: a Halloween egg-timer, one Lipizzan mare, and me. I figure I’ve got 15 minutes to work with Flow, the Lipizzan lady. I dial up 15 and put the pumpkin timer on the fence post. There, I thought just enough time to do one small training task that is super important to me. Can you guess what it is? 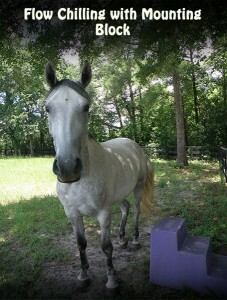 For me, it is having my willing mount step-over very politely to my big purple mounting block. When I was sixteen, I don’t even think I really knew what a mounting block was but now that I’m 40 it’s a must have. I had done lots of prep work with Flow before and I figured that adding in the mounting block was no big deal. The egg-timer continued to tick as I led her over to the block. I walked up the two steps. She looked at me, looked at the mounting block, and then cocked her hind leg. So relaxed she was in the summer heat. I gave her a clear signal to move over towards the block and she moved away. Uh…no, I thought. I dismounted my mounting block and worked on the cue. She did it perfectly when I was back on the ground. Tick, tick, tick went my pumpkin timer. I started thinking, Shoot! I don’t have much time today and I just know she knows this. Then I stopped myself. Lately, I’ve been writing lots about horse wisdom and creating horse meditations. Here’s what I’ve discovered. It’s one thing to write and create and it’s another to be in the moment applying it! So there I stood in my human form doing a very human thing. I wanted Flow to do it now! Hey I’m on a timer! I took a deep breath and Flow did too. I heard a little voice telling me to look at the situation. This is one rule of horse wisdom that can make your life much better. It works like this. When a behavior or something doesn’t seem to be working always step-back and observe the situation. I like to start with the physical and move to the behavioral. It can go from the obvious to the subtle. For example, I didn’t see a cement block in the driveway and ran over it. The fix is to move the block for next time. Easy, right? It can be harder to figure out the fix as in the case of disengaged employees but the same horse wisdom rule applies and works. Horse Wisdom Rule: Stand back and look at the situation. I use three questions to give me a quick overview. Is it something physical or environmental? Did I communicate in understandable way? Can I change one small thing and get a different result? As I stood with Flow, I asked myself the physical/environment question. First, I noticed where the mounting block was in relation to the barn and the other horses. I saw that Flow was closer to the barn and her buddies when she moved away from the block. I thought one easy thing to try was to simply move the block so that if she moved towards the barn she would be closer to the block and in perfect position. I asked myself if I communicated clearly and I thought the cue was understandable but I did change my height by standing on the block so that did change the cue slightly. Armed with this knowledge, I moved the block and stood beside of it instead of on it. I gave Flow the cue and she stepped into perfect position. I tried it on both sides and changed the angle slightly of the mounting block. 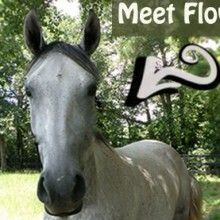 My timer rang and I took a deep breath and said out loud to Flow, “I like horse time better.” I think Flow smiled! Now for the bigger test, I stand on the block, give Flow the cue, and she slides over! I lean over her back and give her a hug. I decide that I will put the block back to where I originally had it. I figured with all the practice fresh in her mind that it would work. So fingers crossed. I stepped on the mounting block, cued her, and she moved over. More than anything, I felt like this experience was positive for Flow and me. Every time we work with horses it should be a pleasant give and give. I firmly believe that setting up a situation for a rewarding good time is key. My pumpkin timer smiled at me when the time read zero and his ringing was done. Apply horse wisdom in all that you do and the spirit of the horse will guide you.